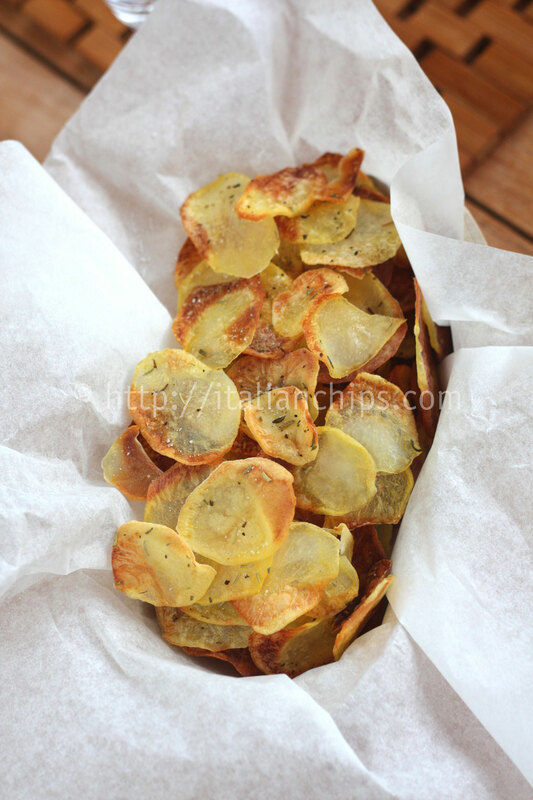 These baked potato chips are really irresistible and I can tell you in advance that you’ll never prepare enough of them. Your family and friends will always ask for more. 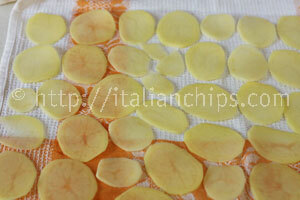 A couple of weeks ago I had peeled and sliced some potatoes to cover a fish. 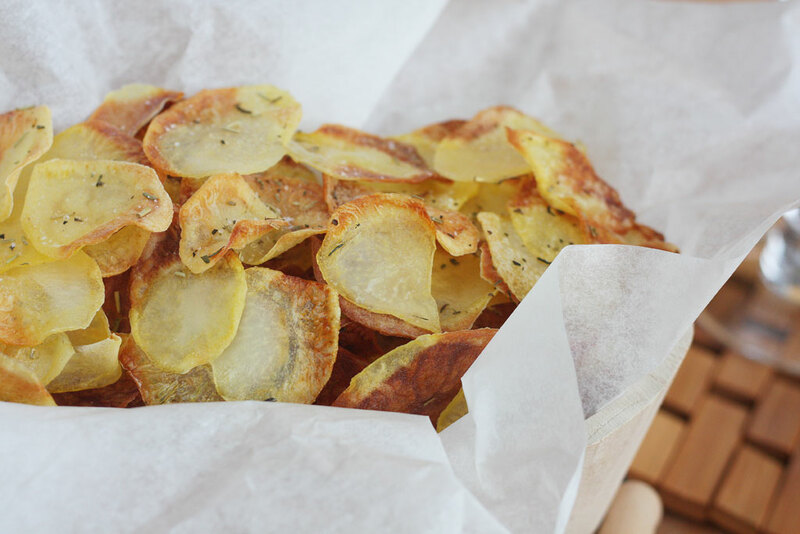 When I noticed the fish I had bought was too small, the potatoes were already sliced… then I decided to try an experiment that turned out to be our new entry recipe: homemade baked potato chips! Third: you have to dry them well before baking. 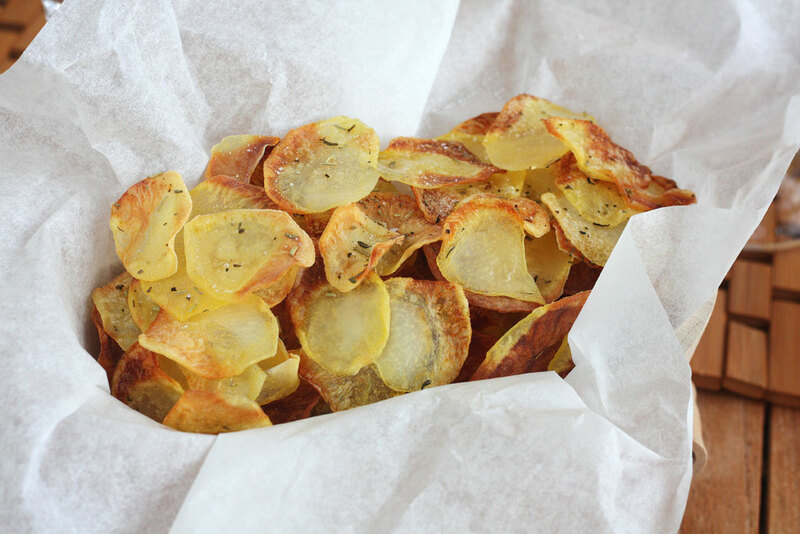 After that you just have to place them on an oven pan covered with parchment paper, taking care of not overlaying them too much (see the step by step photos below). I add some dry herbs, but it is up to your taste. 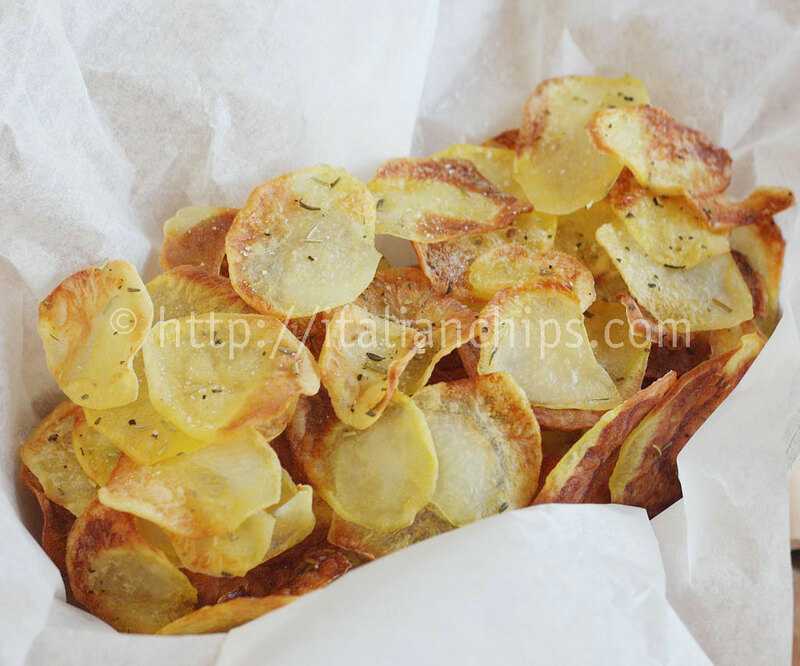 Sprinkle salt when you take them out of the oven and serve. They will last crispy for some hours. I prepared the ones you see on the photos about three hours before dinner and they were perfectly crispy at dinner time. 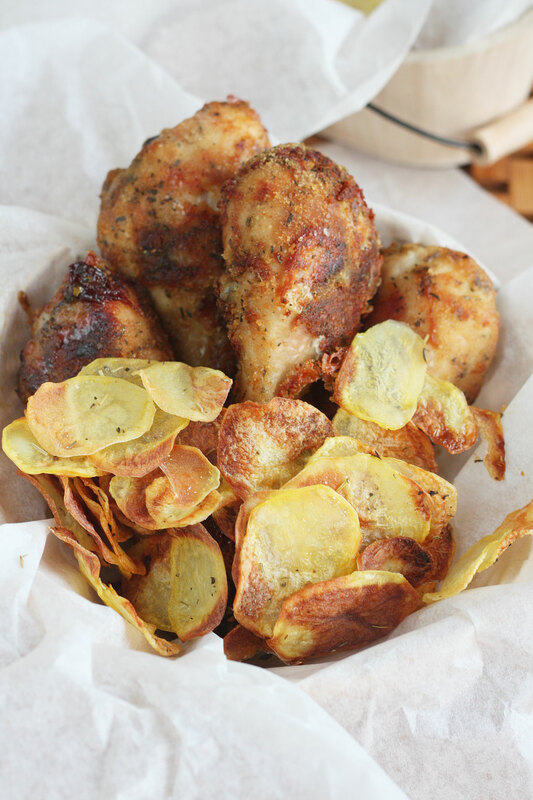 P.s.- The recipe of the “fake” fried chicken you see on the photo is here. 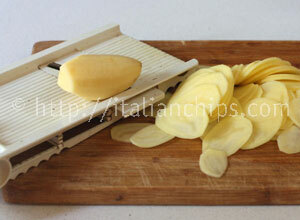 Wash, peel and slice the potatoes using a mandoline. 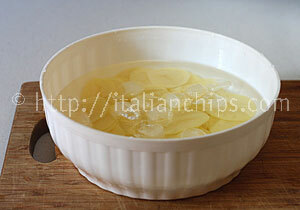 After washing them for two times, let them inside cold water and add some ice cubes. 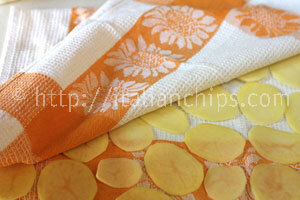 Put them on a kitchen towel (occupy half of the towel). 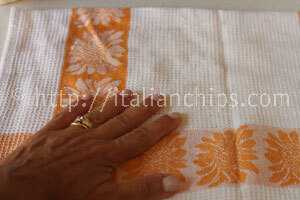 Cover them with the other half of the kitchen towel and press with your hands to dry them all well. 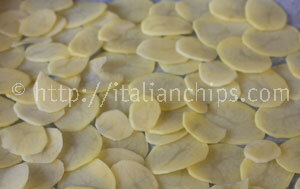 Put them on an oven pan covered with parchment paper trying not to overlay them too much. 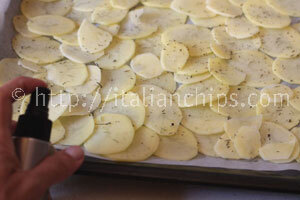 Add some dry herbs if you like and spray extra virgin olive oil and bake until colored. Add salt after taking them out of the oven.